We came up with this “juke joint” BBQ sauce, Clint and I, while I was grilling pork chops. And we humbly named it, “Brandy and Coke Apple BBQ Sauce.” It is worth mentioning that we don’t cook together very often (I definitely wear the apron in the house – a Spider-Man apron, in fact), or this cooperatively, so when we do collaborate on a recipe, please take notes! This BBQ sauce has some great flavor layers: tangy, smoky, and spicy, and the apple texture just brings it all to sweet fruition. 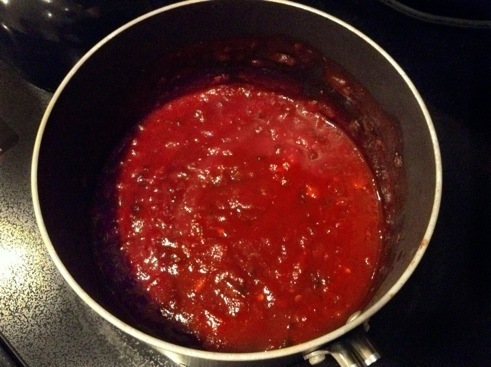 Combine stewed tomatoes, sauce, paste to a medium sauce pan. Dice apple, onion, and pepper then shred a chipotle with a fork and add all ingredients with the simmering sauce on medium high. Measure out remaining ingredients (molasses, Worcestershire, apple cider, maple syrup, coke, brandy, etc. ), all seasonings, and stir in the brown sugar, continuing to build on the flavors. We agreed that the texture from the cooked apples added something wonderful to the sauce but if prefer a less chunky BBQ sauce, a food processor wouldn’t damage this sauce at all. I like what you guys are up also. Such clever work and reporting! Carry on the excellent works guys I’ve incorporated you guys to my blogroll. I think it will improve the value of my site as well.